In this focus Alessandro Sulis (Healthcare Flows group, CRS4) will discuss the need for interoperability between clinical systems, the available standards and guidelines, and how CRS4’s activities contribute to them. In modern hospitals it is crucial that different clinical domains (e.g., laboratory, radiology, etc.) be able to exchange information. From the technical point of view, this requirement implies that different domains need to be able to exchange mutually understandable messages carrying information about patients and healthcare processes. This apparently simple requirement is difficult to satisfy in practice. In fact, clinical systems tend to be designed as separate “information islands” that do not easily communicate with the rest of the world. As a reaction, clinical informatics interoperability standards and guidelines have been developed in the past twenty years and are now starting to be widely supported by vendors. CRS4 is actively contributing to the development of these standards and guidelines – particularly the ones in the Pathology and Laboratory domains – and to their implementation in real-world clinical systems. Alessandro Sulis, Graduated in Electronic Engineering at the University of Cagliari and II level Master in Information Technology, at the Center of Excellence CEFRIEL in Milan. He works at CRS4 since 2007, as a technologist involved on different research projects about biomedical and clinical engineering applied to real clinical contexts. Currently he is working on clinical systems interoperability, following the main standards and best practices; he strictly collaborates with the reference organizations (IHE and HL7 international): in particular, he is a member of the IHE PaLM (Pathology and Laboratory Medicine) domain Technical Committee. process interoperability, addressing systems integration into a work setting. 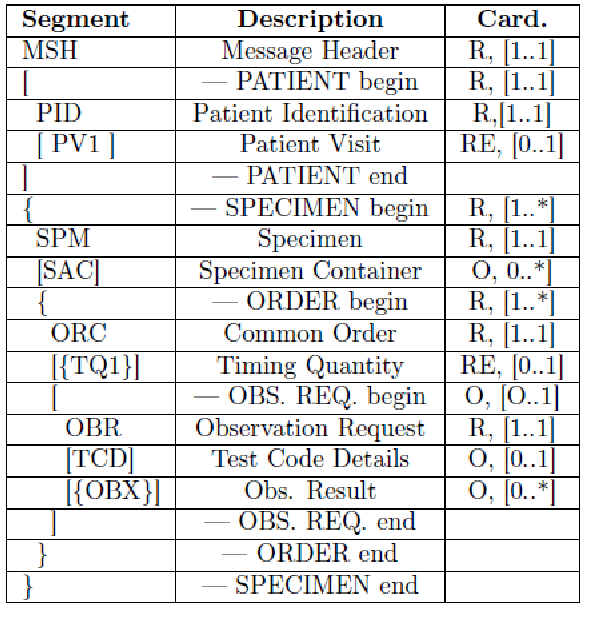 This classification goes beyond simple labels, creating a hierarchical model which can guide interoperability implementation in different contexts: the activity of Healthcare Flows Research Program spans all the three types above and the following paragraphs show some of the results obtained in this field. two utility scripts: an XSD Parser, to generate Python modules for every HL7 v2 minor version; and a Message Profiles Parser, to serialize files for message profiles. 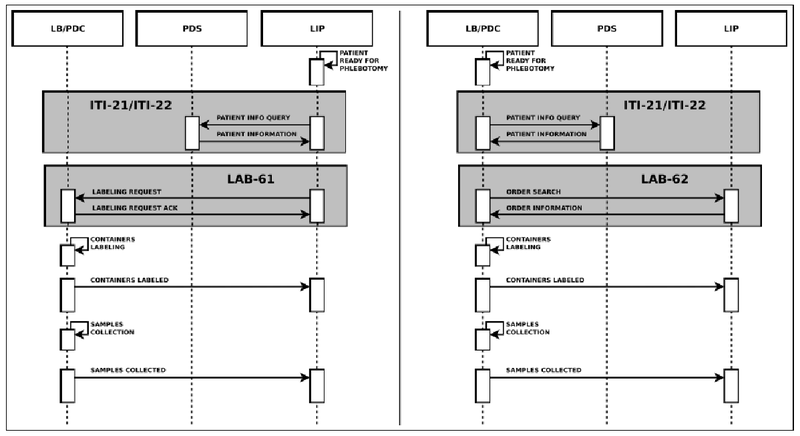 The core classes allow the developer to create HL7-compliant messages, to navigate their structure and to manipulate HL7 elements in a compact form, as shown in the code examples in Figure 2, Figure 3 and Figure 4. One of the most important features provided by HL7apy is the validation of messages, since it ensures their compliance with the standard for the specific message type and HL7 version. The library allows two levels of validation: STRICT and TOLERANT. A detailed description of HL7apy can be found in4; the project is still under development and the code is released under an open-source license5. Label Broker (LB): the actor responsible for the labeling of the containers according to the information provided by the LIP. All of them are based on HL7 messages exchange. Concerning LBL, in a phlebotomy process supported by automation, the robotized labeling of specimen containers considers two different scenarios: Request Mode and Query Mode. These are both showed in Figure 5. The main information needed for the labeling process is carried by the HL7 messages exchanged between the actors. In detail they provide: patient data, drawn specimens with their unique id, tests to be performed on every specimen and type of container to use. This information is very useful for traceability purposes, but no details are provided by the LBL profile regarding the preparation of the sample container and the sample collection. 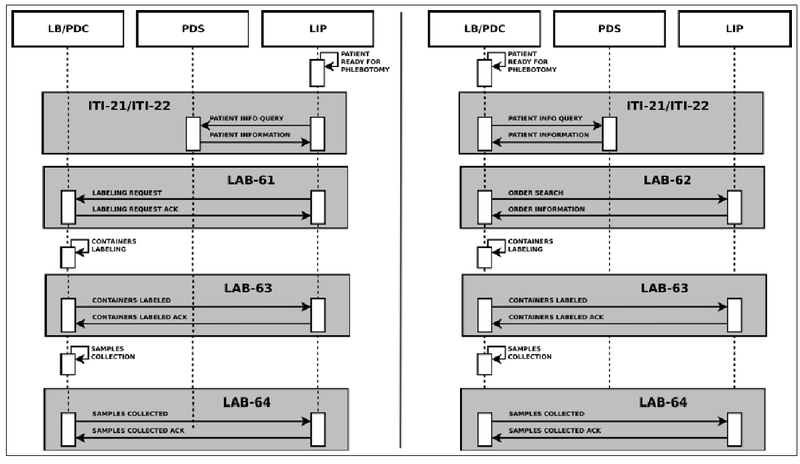 For these reasons, we proposed an extension of this profile, adding two new transactions, LAB-63 (Labeled Containers Production Confirmation) and LAB-64 (Specimen Collection Confirmation), depicted in Figure 6. 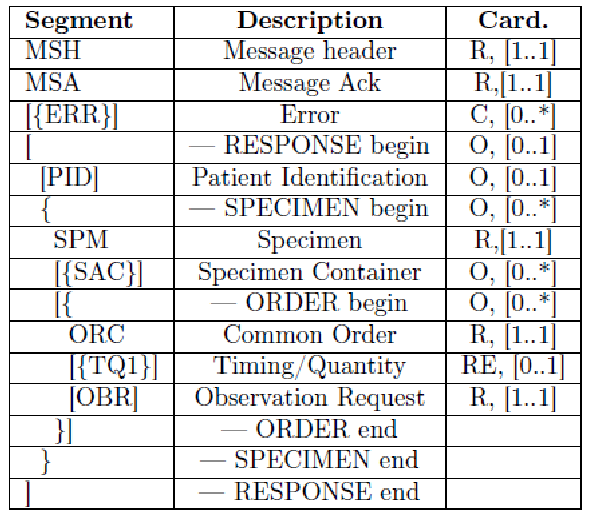 The HL7 messages chosen to define these transactions are OML^O33 (Laboratory Order Message) and ORL^O34 for acknowledgment, since they are specimen-centric and their structures contain all the information needed for traceability purposes. We submitted the profile extension in a Supplement to the Committee for public discussion in July 2011. LAB-63 was reviewed and immediately accepted and – after the trial implementation period – was included in IHE PaLM Domain Technical Framework8. LAB-64 was considered above LBL scope, as it also involves other IHE profiles; for these reasons, the proposed profile became the starting point for a completely new profile, called Specimen Event Tracking (SET), which we have been developing since 2016 in strict collaboration with PALM Technical Committee.